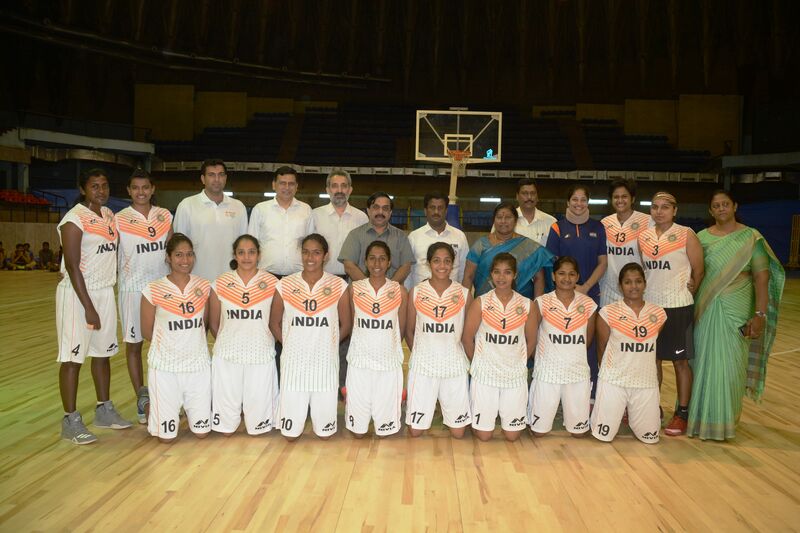 Senior India women’s team faced the under-18 Karnataka squad in an exhibition match as warm up for the upcoming FIBA Women’s Asia Cup, at the Kanteerava Indoor Stadium. The successful conduct of the exhibition game highlighted the level of readiness of the refurbished Kanteerava stadium ahead of the two prestigious FIBA events to be hosted by Bengaluru later this year. The match was played in the presence of Honourable Mayor of Bengaluru Smt. Padmavathi, along with BFI’s senior functionaries Mr. K Govindaraj (President), Mr. Chander Mukhi Sharma (Secretary General), and Mr. Rajneesh Goel (Additional Chief Secretary, Government of Karnataka). The International Basketball Federation (FIBA) has allotted two FIBA Asia Championships to the BFI this year – the FIBA Women’s Asia Cup 2017 and the FIBA U-16 Women’s Asian Championship. Both will be held in Bengaluru. This will mark the first time since 2009 that a FIBA Asia Championship will be held on Indian soil. Bengaluru, 13th May 2017: As the FIBA Women’s Asia Cup fast approaches, the Senior India women’s team suited up yesterday to face the under 18 girls’ Karnataka squad in an exhibition warmup game. The match was played in the presence of Honourable Mayor of Bengaluru Smt. Padmavathi along with Mr. K Govindaraj, MLC, Parliamentary Secretary to Chief Minister, Government of Karnataka, and President – Basketball Federation of India; Mr. Chander Mukhi Sharma, Secretary General – Basketball Federation of India; and Mr. Rajneesh Goel, Additional Chief Secretary to Government of Karnataka. The Basketball Federation of India (BFI) had earlier announced that India had been allotted to host two international events in 2017- the FIBA Women’s Asia Cup and FIBA U-16 Women’s Asian Championship. This will be the first time since 2009 that India will be hosting a major International Basketball Federation (FIBA) event. The FIBA Women’s Asia Cup will be held from 23rd to 29th July 2017, while the FIBA U-16 Women’s Asian Championship will be held from 22nd to 28th October 2017. Both these events will be held in Bengaluru, Karnataka. The successful conduct of the exhibition game highlighted the level of readiness of the refurbished Kanteerava stadium ahead of the two prestigious FIBA events to be hosted by the city later this year. FIBA had allotted these events to India with utmost confidence and support, based on the steady increase in on-court quality of the Indian National Teams over the past two years since the new leadership of the BFI, led by President K. Govindaraj and Secretary General Chander Mukhi Sharma, took over. Over these last two years, the Men’s National Teams have been breaking historic ceilings by making the quarterfinals and eventually placing 8th in the 28th FIBA Asia Championship in 2015 and again making the quarterfinals and placing an all time best 7th Place in the FIBA Asia Challenge 2016. With these two events being hosted in India, the BFI looks to promote and develop the Women’s National Teams to reach the same success as the Men’s sides. In 2009, the BFI was allotted the same two Championships – the 1st FIBA Asia U-16 Championship for Girls in Pune, Maharashtra and the 23rd FIBA Asia Championship for Women in Chennai, Tamil Nadu. The opportunity to host both events again will prepare the BFI to begin hosting home and away FIBA Asia Qualifiers, which are scheduled to begin in November 2017. There will be 16 teams participating in both the FIBA Women’s Asia Cup and the U16 Women’s Asian Championship, with 8 teams in Division A (which include new Oceania teams Australia and New Zealand) and 6 in lower Division B.
India is in Division B in both the Senior and U16 events.